Pete Buttigieg’s suddenly in the spotlight as one of the newest 2020 Democratic candidates for president. 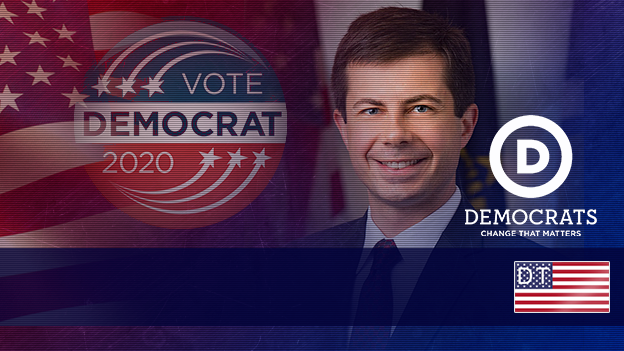 And well he should be: he’s intelligent, articulate, thoughtful, with a genuine record of public service as mayor of South Bend, Indiana, and an Afghanistan veteran. He’s also progressive, a Harvard graduate, a Rhodes scholar, speaks numerous languages, and is openly gay. I’d never heard of him before about a month ago; now, he’s everywhere (in media terms). And he’s impressive. After his stellar performance at a recent CNN town hall, he easily gained the 65,000 individual donors necessary for him to be eligible for the Democratic primary debates. Though his fundraising numbers have skyrocketed, he still lags far behind better-known candidates like Bernie Sanders, Kamala Harris, and Beto O’Rourke. I personally admire him, and am becoming a fan. And I’ll let others wring their hands over whether or not America is ready for an openly gay president. I have faith in us; we can handle it. My biggest hesitation, though, is that he’s another white guy in a field dominated by white men – straight or otherwise – and I know there’s ongoing bias in the media for white men and against women (whether of color or not). Media coverage especially at this early point in the race can make or break a candidate. If I had a magic wand, I’d implore reporters and editors to focus less on the women candidates’ “likeability” and their outfits, and more on their policy platforms. I mean seriously, when was the last time you heard any media person fretting about Bernie Sanders’ likeability? As well, there are highly qualified women presidential candidates such as Senator Elizabeth Warren and Senator Kamalah Harris who have vastly more national political experience along with deep policy chops than Mayor Pete Buttigieg, and who are equally impressive. So my wish is for neither of these women to be overshadowed by the rising star who’s also white and male. Which is why I was delighted when he became eligible for the primary debates (disclaimer: I was one of the individual donors). Buttigieg is an impressive speaker, with deep command of the facts of a variety of important policy issues. I believe he’ll elevate the tone and substance of the debates. Plus, those of us who watch will be able to see the candidates go head to head with each other, and we can start to draw our own conclusions rather than rely solely on media reports. Yes, the candidates of course prepare their answers, but as we all know, no matter how well prepared they are, there is always the opportunity for impromptu discussion. Thus, I’m eager for Americans to have the opportunity to get beyond the media focus on the rising star white man, and to see how he fares against – for example – Senators Warren and Harris. So pay attention to Mayor Pete, as he’s known. There’s a reason he’s been dubbed a rising star; it’s an appropriate designation. Granted, the big stage of presidential politics is light years different from mayor of a small midwestern city. But so far he’ handled himself with aplomb. He could be a dark horse candidate.